There have been upheavals in the world of Pepsi in recent weeks. We saw the emergence of two--TWO--things which were Pepsi, yet not Pepsi. We saw the appearance of Pepsi Natural, made with ingredients such as cane sugar and kola nut extract; it was supposed to be Crunchy Granola Pepsi, I think. I bet they didn't call it Pepsi Green only because they would have had to use artificial green coloring to avoid confusion, thus invalidating the whole premise. Or I suppose they could have let algae grow it in. That would have been all natural, and probably even nutritious. But ewww. In any case, we also saw Pepsi Throwback. What, pray tell, does it portend to label a soda flavor "Throwback"? This name led to some degree of confusion; was this some sort of recipe rejected by the bottler, but obtained by rebel bottlers or something? Those who love Neal Stephenson (as I do) and have read Anathem (as I have, twice) may have had visions of a product of Orolo's library grape being bottled as a Pepsi product. Or maybe it was so bad that they anticipated the reaction of those quaffing it to be violent and forceful rejection (and "Pepsi Throwup" was just too blatant). Well, while Pepsi is hardly Weird, something named "Throwback" is worthy of our attention and quaffing. For comparison, I will also quaff some non-Throwback, un-Natural, garden-variety Pepsi. It won't get the full review, though; I'm planning a Totally Normal Soda Review day here at the Lab. Color: identical to regular Pepsi. Standard cola dark brown. Scent: A bit sweeter and more mellow than regular Pepsi. Less "dusty", more orange scent. Taste: Assessed without reference to regular Pepsi, I would call it a smoky, citrusy cola with a fair amount of spiciness. It's actually reminiscent of anise or licorice. The cane sugar is distinctive. There is a slight bitterness, almost a nut-like tone, but it's faint. It fades pretty quickly--the mid-taste is sweet, with a slight citrus. That citrus becomes stronger as the aftertaste comes out. Interestingly, it's closer to Coke than regular Pepsi. The sweet is deeper and a bit spicier, with a slightly more citrus-y taste. If regular Pepsi tastes like lemony furniture polish, then Throwback tastes like furniture polish with more strawberry and orange. The extra mellowness is nice; for me, regular Pepsi has always been a bit harsh, and this is a nice compensation. This is fairly nice stuff. It's got a strong acid bite, and it makes my teeth feel as though they are going to dissolve. The feel is harsh and acrid, but the flavors are pretty pleasant. Not for throwing back, unless the acid is too strong for you. EDIT: The Kibbitzer-in-Chief has informed me that the transitive verb "to throw back" can also refer to what one might do with a shot of an alcoholic drink which one did not want to leave in one's mouth. I was completely unaware of this. My barfly cred may never recover. Since the main plus of Pepsi Throwback is its interesting flavor, I don't see the point of "throwing it back" in that sense either. Quaff rating: 3. Fairly pleasant. Cough rating: 1. A bit harsh and biting for me. Hey, kid. Come on over here. What, you afraid? Ain't nothin' to be afraid of, kid. Not in a nice neighborhood like this, leastways. Got a story for ya, kid. One worth hearin'. See, kid, I'm a guy who likes to know the truth. That's my business. People come to me, tell me their stories, and want me to find someone. Or lose somone, sometimes. By the time you get to be my age, you've heard 'em all, kid, and sometimes what you hear ain't so pretty. In my line, sometimes you see the underside of the boot, where the gum sticks and the water splashes up as you walk down the alley. Sometimes, you see the back side, the zig under the zag, the things behind the world they show ya on TV. You watch TV, kid? Anyway, I was gonna tell you about the night this dame came into my office. It was hot that night, and humid like the jungle had sidled on up to the city and passed it a tenner. You couldn't see the stars for all the fog in the alleys, lit up by the sputtering neon sign outside my window. It ain't a nice view, kid, but it's all I can afford. The view sure got better when she came in, though. "I've heard that you're a man who can find things," she said. Her voice was low and smooth, like a new set of subway rails. "Depends," I said, "on what you're looking for." I looked her up and down. "And what you're offering." "I'm offering five hundred a day, plus expenses." Well, that got my attention. I sat up a little straighter. I'd had a look in my wallet a few minutes before. My wallet and the Buddha had something in common, kid--they were both filled with true emptiness. "All right. Why don't you sit down, Miss--"
"It's Mrs., for the moment. Mrs. Von Bingen." "Where's Mr. Von Bingen? He doesn't mind you being out like this? Or is that what I'm looking for?" "You're looking for this. Find it, and you'll find him." She pulled out a photo. They always do. It was grainier than a silo in Iowa, but I could make out a shape I knew all too well. A bottle. "Your husband got drunk and disappeared, ma'am? Is that it?" "No, he went off searching for something. Something he heard about in that stupid club of his." "Ma'am, why don't you tell me all about it." She told me the story about how Mr. Von Bingen belonged to this club of conoisseurs of strange beverages from all over the world. They met in an old gentlemen's hangout over a billiards hall and passed around the craziest concoctions that they could find, stuff from all over the world. Well, apparently one night, one of them brought in something really special. Mr. Von Bingen had one sip, and couldn't stop raving about it. When he came home that night, he kept his wife up until all hours talking about it. He said it was something called "Malta India", and that he had to go find more. She told him no, begged, even pleaded--and I have to tell you, kid, I wouldn't be inclined to refuse this lady if she asked me something. But he was in the grip of this Malta India, and it wasn't about to let go. He left that same night--she assumed he'd gone to Bombay. That was six weeks ago, and she hadn't heard anything since. "Well? Can you find him?" "Yes, ma'am, I think I can." "So when do you leave for India?" She gave me a look that said she wasn't in the mood for games. And while I'd bet she'd have hotels on Park Place and Boardwalk in less time than it took me to get a house on Oriental Avenue, I wasn't playing this time. "Look at the bottlecap in the picture, Mrs. Von Bingen. Can you read it?" "No, I can't make it out." Her face was right next to mine, now, and I could smell her perfume. It was quite a relief from the smell of gunpowder, alley, and cantaloupe that you usually get in my office. I love a good cantaloupe. "It says 'Malta India, Puerto Rico. Your husband is there, ma'am." "Well, why does it say India?" "The world doesn't always make sense, ma'am." She game me a look which went from colder than the blizzard I saw on Little House on the Prairie to warmer and sultrier than Sesame Street in July. Well, we went to Puerto Rico. I'd been there once before, but the local magistrate and I had had a difference of opinion regarding my activities around the local fruit market, so I hadn't been back in a while. When our flight landed, it was dark and humid. The puddles in the alley from the airport to the hotel reflected the brick and neon of the walls of the city, and the sign of a local liquor store. The sign in the window read "Malta India Our Specialty." The door opened, and a man came stumbling out, clutching four cases of bottles. As he got closer, I saw three days' growth of beard, and eyes that looked out from his deep sockets like a man seeing the last life raft drifting away from him as he goes down on the USS Lollipop. He dropped the cases and clutched at my coat lapels. "Here! You...have to...take it. Don't...let...them get it. Hurry..."
He pushed a bottle into my hands, then slumped to the ground like a rod of Silly Putty on the sidewalk in Kansas in August. I heard voices, and footsteps coming around the corner. Mrs. Von Bingen and I just made it back to the hotel in time. "That was your husband, ma'am. And he died to make sure we got...this." It was a bottle of Malta India. And we knew, looking into each others' eyes, that it was time to take the quaff. The ingredients list said that we'd find malt, corn syrup, molasses, and hops. I wondered if we'd find hope, or if that was the sort of thing you couldn't buy at a corner store in Puerto Rico. Where and when: purchased on a dark night, when the heat felt like someone threw a couple of old horsehair blankets over the city, in April 2009 at Galco's, Los Angeles. The City of Angels. What a laugh. Color: a dark, dark brown. It reminded me of a drink I had once, in Marrakech. It went down like a parrot on crack, gouging my throat as it went. But after what I'd just seen, I barely felt it. Scent: The smell went up my nose like a ferret who just spotted a ferret broad wearing nothing but two sheets of fabric softener and a kind word. It smelled like hops, mixed with a bit of marsh water and a cup of good honest joe. Smelling it reminded me that it had been three days since I'd had time to wash my socks. Taste: Tell me, kid, have you ever taken a good left hook right to the jaw? The kind where you can tell what high school the other guy went to cause his class ring is embedded so hard in your face? Well, maybe you haven't--not a nice kid like you. But let me tell ya something. I've had that kind of friendly goodbye from more bar bouncers than you had candles on your last birthday cake, kid, and it never gets any easier. Given a few of 'em, too. This stuff hits your skull like one o' those, but with a couple of shots of rum and Coke thrown out the door onto the wet pavement you landed on. It 's a malt, sure--I remember those chocolate malt balls the other kids used to throw at me when they made fun of my trenchcoat back in fifth grade. This tastes kinda like those, with a touch of the bitterness that hit me when I saw the way the collar had been turned down. But it ain't all bitter, kid. I saw you lookin' at that dame in your class. You couldn't take your eyes of her, could ya, kid? She sure looked like a sweet girl. This drink's got some of that same sweetness, kid, kinda figgy, the kind that'll make the street a little less cold when it's 3 in the morning, the Italian professor's trail's gone cold, and the corner store just ran outta Pringles. Yeah, it's sweet. But it ain't sweet enough. I think the Kibbitzer-in-Chief said it best, before she was gunned down by the guards in that Tibetan temple. "It tastes like someone made beer out of prune juice." Quaff rating: 2. The bitter of the malt goes oddly with the hops and sweet. Not very pleasant. Cherry cream sodas...well, it goes without saying. Stewart's is not an extremely Weird soda brand, nor is it particularly rare. You can find varieties of Stewart's at a number of grocery stores; they have nice cream sodas, as well as grape, orange and cream and strawberries and cream varieties. However, the king--the creme de la creme, as it were--of Stewart's flavors must be the Cherries 'n Cream. I've had trouble finding that one; just as out of hundreds of thousands of pebbles, the one made of pure bacon is rare and precious, so also is the four-pack of Cherries 'n Cream a precious gem amongst lesser sodas. The Kibbitzer-in-Chief informs me that she has, in fact, never found a bacon pebble. I think my point is made. In any case, I was delighted to come across a pack of Stewart's Cherries 'n Cream at Frazier Farms. I'm coming to regard Frazier Farms as the grocery equivalent of the Norse god Loki. In a book of myths I read recently, Loki is described as the "doer of good and the doer of evil". Frazier Farms has provided Natural Brew Vanilla Cream Soda and Stewart's Cherries 'n Cream. It has also provided Biotta Digestive Drink. Let's see if this Stewart's lives up to my fond, fond memories...and test its cherry goodness against the others we have recently quaffed. Color: red, but a deeper red than some. Ruby rather than scarlet. Scent: A neutral cream, somewhere between the bitter of Natural Brew and the acid of A&W, but richer than Weinhardts or Faygo. As to the cherry, I'm intrigued. It's subtle. Taste: Mmmmm, yep. That's good stuff. There's a very interesting balance between the moderately deep, smooth vanilla cream and a tart, fruity cherry. The cherry flavor is quite sweet, with plenty of fruit in the initial taste. That is immediately followed by a surprising tartness, quite sour, similar to what you get in things which claim to be "black cherry" flavored. This cherry flavor is closer to the medicinal variety than the popsicle variety, but the usual medicinal bitterness is absent. It's probably worth noting that this is sweetened with high fructose corn syrup; I suspect cane sugar would improve it. The aftertaste is sour, which may come from that. Quaff rating: 4.5 Quite yummy. Cough rating: 0.5, just for the HFCS sourness. We had previously reviewed Moxie Original Elixir, and found it to be, indeed, Weird. A strange blend of bitter and sweet, cola-ish, with something that may be gentian root adding the unmistakable flavor of "take-it-it's-good-for-you" to the mix. Tasting Moxie was like a return to one's childhood--a time when things frequently made no sense to you, when we were told that "older" was synonymous with "right and good", and we had to eat and drink that which was put in front of us, because people were starving in China. Why, exactly, the fact that people were starving in China should motivate me to eat food I didn't like was not clear to me then, and whether there is a Moxie shortage in China now, thus justifying its consumption, is not clear to me now. But I digress from today's Weird Soda, which is also Moxie. However, this is a Moxie subspecies; this is Moxie Cherry Cola (Moxie cherrycolaensis). The label claims "Since 1884", which is identical to the claim on the bottle of generic Moxie (Moxie vulgaris). This isolated prepositional phrase is left unexplained. The implication is that Moxie and its lineage have existed since 1884, but it is not explicit; it is possible that this particular bottle was sealed in 1884. -Dr William Price attempts to cremate the body of his infant son, Iesu Grist (Jesus Christ) Price, setting a legal precedent for cremation in the U.K.
-The eight-hour workday is first proclaimed by the Federation of Organized Trades and Labor Unions in the United States. May 1, called May Day or Labour Day, is now a holiday recognized in almost every industrialized country. - International Meridian Conference in Washington, D.C. fixes the Greenwich meridian as the world's prime meridian. - Democrat Grover Cleveland defeats Republican James G. Blaine in a very close contest to win the first of his non-consecutive terms. I further note that Texas Guinan and Auguste Piccard were born in January 1884 (The Star Trek fanfiction possibilities!...). Which, if any, of these events are associated with the bottling of Moxie Cherry Cola is unclear (although I fervently hope it is not the first on the list--ewwww). And if this particular bottle was sealed in 1884, then it may well be the last I ever review. If so, someone please update Wikipedia accordingly. Let's find out if the addition of cherryesque flavoring represents an evolutionary step for Moxie. Although...if they are both from 1884, then they may well both be descended from a pre-Moxie common ancestor. We shall call it Cro-Moxie. Color: very dark brown, like a dark cola. Scent: The Junior Assistant Tester and Lead Assistant Tester both say it smells like cherry cream soda. I smell the cherry, but not the cream. It smells a lot like modern cherry cola, and--oddly--not very much like Moxie. Taste: The gentian root is entirely absent from this. It's got a strong cola taste--a lot of syrup, which is evident in the aftertaste--lingering sweet, with a fair amount of acid. The cherry taste is also strong; it's very similar to the liquid one finds around Maraschino cherries. Yeah, I drank that stuff straight from the jar, and so did you. It's neither the fake medicine-y cherry nor the popsicle cherry flavors discussed in the review of Red Ribbon Cherry; a new cherry flavor. Actually, this is almost exactly like what you would get mixing regular Coke with maraschino cherry juice. Which is good. Very good. The aftertaste is sweet and acid, and my teeth feel quite sticky. Possibly the best cherry cola I've had. And it doesn't taste anything like regular Moxie, which is also good. LAT: "Cherry coke, or maybe strawberry coke." Quaff rating: 4. Excellent cherry cola. Cough rating: 0.5. Slightly oversyrupy, to the point of stickiness. Continuing our theme of nationalistic Weird Sodas (which has manifested in Bravo Kolashampan, the "official drink of El Salvador", and Ironbeer (which we dubbed Anti-Commie Cola)), tonight we're heading to Europe. The Lab has obtained a bottle of "Almdudler 50 Jahre", which a label proclaims to be the "national soft drink of Austria". This is confirmed by the presence on the front of the bottle of a man in jacket and lederhosen attempting to kiss a young woman in Tyrolean garb. Both of these people are wearing impressive hats. This is bottled by the Real Soda in Real Bottles company, who also import a number of other sodas. They appear to be helping this Austrian invasion of the US. 50 Jahre translates to "50 year". The significance of this designation is not explained, so we are free to speculate. What happened in 1959 in Austria? We must also take this opportunity to investigate how bottle bottom bumples vary between nations. Investigation reveals that the bottom margin of the Almdudler does not have the usual coded bump row; instead, it has a series of actual numbers. 36.5 3 (tripod-ish symbol) 0.351 1 (dense grid of small dots). Those who know more than I may be able to derive some sort of interesting information from this. The 0.351 probably refers to liters...the 36.5 might be a body temperature in Celsius...and we all know who the Tripods are; John Cristopher made it all clear in The White Mountains. And that had mountains in it, and Europeans--just like Austria! Austrian aliens in robotic tripods will control our minds via Almdudler. Scent: reminiscent of a citrus-y ginger ale (more like Canada Dry). Taste: Fairly tart initial taste--lemon or orange. Not a very strong taste, with the orange fading into a slightly medicinal or herbal bitterness, which lingers in the aftertaste. The herbal is not like ginger, although there is a hint of that in the mid-taste, just after the orange. It's more like ginger ale than anything else, but with lemonade or orangeade mixed in. The orange and bitter do not go as well together as they might, and the overall impression is not strong. I'm left with a vague impression of something sort of nice, but which didn't have a satisfying ending. Didn't The Sound Of Music take place in Austria? It all fits together! Quaff rating: 2.5. Just not that interesting, but pleasant enough. Cough rating: 0.5. The slightly medicinal bitterness is not a plus. I think it would be fun to do a series of reviews of sodas representing different political alignments. I'm not sure what you would use--perhaps Green River (for the Green party) and OpenCola (for the libertarians or techno-anarchists)? Heck, we could go further; I'll bet someone could find something suitable for all the parties, including Peace and Freedom, American Independent, Reform, etc...not to mention the Republicans and Democrats (which I can just hear my mother and brother (both Libertarians) suggesting being represented by Coke and Pepsi--people argue vigorously over their relative merits, and claim huge differences between them, yet they are virtually indistinguishable, ubiquitous, and control a huge percentage of the market). "On a Summer's afternoon, in 1917, a mule-drawn, wooden wagon arrived at a popular cafeteria in Havana, Cuba. It delivered the first four cases of a new soft drink that would soon be called, 'The National Beverage'. Now, more than 80 years later, IRONBEER is still enjoyed for its refreshing flavor with just a hint of island spices. A lot can change over the years - but not the original flavor of IRONBEER!" of the USA. Thus, while it is tempting to brand a Cuban-oriented Weird Soda as something like "Commie Cola", it would be inaccurate to do so. The Ironbeer Can-ifesto from which I quoted above seems to specifically deny Cuba's current regime, and hearken back to the idyllic days in which it was a beloved, closely-watched niece of the late-WWI United States. The Kibbitzer-in-Chief is analyzing the artistic representations on the can. At first glance, she says the can (red with yellow graphics depicting a shirtless, heavily-muscled man flexing his bicep) is reminiscent of the socialist "Achievement of the Five-Year-Plan" posters, featuring strapping farmers and such. However, she feels that closer examination suggests that the heavy musculature of the figure suggests a very different imagery. K-i-C: "This man's body is not covered. He is not serving his role, as represented by his clothing--he is serving himself. He's celebrating his own power, as expressed in the glorification of his own body. He is a superman, and while Superman in the 1930s is nowhere near as conservative as he would later become, he was never a socialist." The K-i-C is capable of delivering a well-reasoned and insightful analysis of soda can imagery at the drop of a hat. I am capable of making occasional snarky comments and bad puns. I further note that Ironbeer is currently bottled in Miami. I suspect this is more of an "Anti-Commie Cola", actually. Let's open it up and enjoy the Invisible Hand of Ironbeer! Color: very dark brown, darker than typical cola. Scent: Hmm, interesting. Cola-ish, but with strong citrus. Sort of like Coke-Sprite mixture, but with a fruity tone, as if there were strawberry Starbursts in there too. Very fruit-juicy. Taste: Oh, neat. It's cola-based, I think, but with a very strong fruit juice kick. Not all that acidic; the acid is relatively mellow and non-biting. I can't quite decide what fruit that is. It's not lemon or orange, nor passion fruit, nor grapefruit, nor apple nor grape. It's some sort of somewhat tart berry--I think strawberry or raspberry is close. I suppose it could be acai berry, or something exotic of that sort. In any case, it's good. Very good, even. According to the label, the main sweetener (the only one listed) is fructose. Not high-fructose corn syrup--just fructose. Interesting. Quaff rating: 4. Very nice. The whole lab staff likes this one. Cough rating: 0.5. Maybe ever-so-slightly too sweet, but nothing else objectionable. I have very mixed feelings about cherry flavor. In general, it is among my favorites. Cherry popsicles, for example, were always my primary target in summer popsicle-acquisition forays. Grape and orange? They'll do in a pinch...but cherry was really where my heart dwelt. I am also a fan of cherry Coke. Real cherries--Bing, black, or even (ohh, lovely, lovely) Rainier, are always a treat. Especially Rainier. The yellow and red ones, with firm flesh and lots of juice? I will do a lot to get my hands on Rainier cherries. However, cherry flavoring has its dark side, whose archetype is embodied in the cherry flavoring you find in childrens' medicine. This stuff is why children fear medicine--why they lie awake in their beds, stifling any minor coughs and with strategically placed ice-packs to mask evidence of fever. They are all too aware that at the slightest hint of sickness, crack squads of ninja parental minions will emerge from unknown recesses in the room, rappell in through skylights, crawl out of heating vents, or cut straight through the wall with their katanas. They will immobilize the child until the Parent itself arrives to administer the hideous sacrament of the Childrens' Tylenol Syrup with Easy-Swallow Cherry Flavor. None have emerged unscathed. I was enjoying my cherry Dr. Pepper the other day, until I went into Quaffmaster mode, sniffed carefully, and realized that the cherry flavoring in it had a horrible, hideous familiarity, which made images of shining katanas, lithe black-clad minions, and a silver spoon brimming with viscous, blood-red liquid come to mind. Anyway, this stuff is supposed to be different. The folks at Galco's said it was something quite special--a cherry soda which did not recall medicine. Oh please, let it be so. Color: Bright scarlet red. Slightly on the orange side. The color of a cardinal against a snowbank in which someone peed a few days ago. Scent: Cherry popsicle! Oh, praise be to heaven, cherry popsicle! That wonderful, sweet yet a bit tart scent. The katanas vanish, replaced by sticky red-stained hands, wooden sticks with tiny bits of crimson ice stuck to them, and a release from the misery of a hot, humid Kansas summer. Taste: Hold on, I'm still smelling it. It tastes almost exactly like carbonated, melted cherry popsicle. Slightly milder than I might have guessed. It's the right stuff, though. Best taken in small sips; the taste is fainter than you might guess, and you'll want to savor it. Oh...wait. Hmm. That's disturbing--in small sips, the popsicle-ness is adulterated by a hint of medicine. Could this be just the perverseness of the human psyche, insisting that my joyous memories be tainted by the tattered fringe of despair? No, I think there might be two kinds of artificial cherry flavor. This is 90% the good kind, but 10% the bad kind. And that's not all bad. It reminds us, even in our moments of ecstasy, that the sweet is sweeter because of the moments of bitter. Needless to say, it tastes nothing like actual cherries. But that's not really what you want. Unless the thing you're eating is a cherry or based on actual cherries, you know it's not going to taste like cherries. You hope it's going to taste like cherry popsicles. This gets you most of the way there. Cough rating:0.5, for the poignant, inevitable, yet bitter memory it brings up. Can there be no unsullied childhood joy? Should there be? I picked this one up at Galco's. My experience with guava is limited mostly to some popsicles which I sort of liked, so I'm going into this without a lot of prejudice. Color: Pink. Only slightly cloudy. Cheerful, in a way I don't quite trust. K-i-C: "It's the color of a pink fluffy bunny." Scent: Somewhat like pink lemonade, with a berryish tone on top. Just a tiny hint of bitter, like grapefruit. Surprisingly tart. Taste: Not a very strong taste. The initial taste is mild; watery lemonade. The berry/bitter follows shortly thereafter, but mild. Pretty pleasant, actually. Not very sweet, but not extra tart. The K-i-C is still twitching, ten seconds after her swig. But she doesn't like guava. K-i-C: "Tastes like sweetened tin can." I like it better than that. Quaff rating: 3. Pleasant but unremarkable. An interesting taste. Cough rating: 1.0. The slight bitter is (apparently) off-putting. Person 1: "Hey, I got some great ribs the other day." Person 2: "Where did you go?" Person 1: "That place that always looks like it's on fire." ...and Person 2 always knows where they mean. Anyway, it's called Primo's, and mostly deals in Mexican groceries (and some great barbecue). While I was there last, I saw that they had a variety of Weird Sodas which I hadn't seen before. Alas, I was on a guacamole-acquisition mission whose completion would brook no delay, so I only had time to grab these two. They had a display in which tiny (half pint) plastic bottles of a soda I had never seen were on offer. On closer inspection, the brand name was revealed to be "Chubby". Needless to say, I had to grab a few. There were three flavors, Cola, Blueberry, and Pineapple. I decided to leave the pineapple for another day. Color: The Cola flavor is cola-colored, dark brown. The Blueberry is bright, transparent blue. Cola: Pepsi-ish, as opposed to Coke-esque. Sweet, slight bitterness, more lemon than orange. Blueberry: That's really weird. It smells about 60% like gum, 30% like unspecified berry, 5% vanilla, and 5% swimming pool chlorine. K-i-C: "It smells like blue Blow Pops...in a hot tub." *pauses* "I want a Blow Pop." Cola: Strange. The initial taste is simple cola, but it fades out in a few seconds. Lemon Pledge takes its place. Seriously--it has a strong taste of lemon, and slightly sweet, and vaguely oily and synthetic. I suspect my pharynx is sparkling clean. It lingers for quite a while. Blueberry: That's the first time the unpleasant taste has been in the *initial* taste, then faded out. The chlorine is gone almost immediately. The gum/berry stays for a bit longer, and are gradually joined by...lemon Pledge. I kid you not, it's the same thing! It ends up tasting a bit like a lemon crepe with powdered sugar and berries, eaten on a recently-polished table in a resort restaurant which happens to be located near the swimming pool. Cola and Blueberry get the same ratings. Quaff rating: 2.5. Very sweet, interesting flavors, easy to drink. Cough rating: 1.0. Furniture polish is not very high on the yummy scale. I couldn't pass this up when I saw it at Mitsuwa Marketplace. I mean...it's called "Miracle of Grapefruit". The can is blue, with a yellow map of the world with latitude and longitude grids projected onto it. For some reason, there are two prominent yellow dots on the map; one is in central Florida, the other is in Israel. I have no explanation for this. In the middle of the Atlantic--possibly representing Atlantis--is an enormous yellow grapefruit. Color: whitish, translucent (mostly transparent). Lots of grapefruit pulp floating in it. Scent: Fairly strong grapefruit, but sweet. Like a sweet Ruby Red grapefruit. Taste: I don't know about miraculous, but it's pretty good. Not carbonated. The grapefruit juice and associated bitterness is present, but the bitterness is relatively weak. Pretty sweet. Tastes like sweetened, slightly diluted grapefruit juice, which (based on the ingredients) is really all it is. Pleasant, refreshing. The K-i-C says it's sort of like graefruit-ade, and Long Rod McBean suggested that it was much like the juice you squeeze off of a morning breakfast grapefruit which has had honey spread on it. "On the third day, a wedding took place at Cana in Galilee. Jesus' mother was there, and Jesus and his disciples had also been invoted to the wedding. When the wine was gone, Jesus' mother said to him, 'They have no more wine'." "'Dear woman, why do you involve me?' Jesus replied. 'My time has not yet come.'" "His mother said to the servants, 'Do whatever he tells you.'" "Nearby stood six stone water jars, the kind used by the Jews for ceremonial washing, each holding from twenty to thirty gallons. Jesus said to the servants, 'Fill the jars with water', so they filled them to the brim. Then he told them, 'Now draw some out and take it to the master of the banquet.'" "They did so, and the master of the banquet tasted the water that had been turned into grapefruit juice. He did not realize where it had come from, though the servants who had drawn the water knew. Then he called the bridegroom aside and said 'Everyone brings out the choice wine first and then the cheaper wine after the guests have had too much to drink; but you have switched to grapefruit juice. What's up with that?' And the servants did say 'Lo, he hath done it.'" "And then Jesus sent them all to Disney World." Those verses were always somewhat opaque to me. Now I understand! What a great Weird Soda. Quaff rating: 3.5. Pretty nice. Cough rating: 0.5. While it wasn't a problem for me, some might dislike the bitterness of the grapefruit. *The special Utterly Bogus Edition. When you think about it, it can be hard to identify what Weird Sodas have in common. In the Venn Diagram of beverages, what defines the line which separates Weird Soda from other drinks? Or is it more of a probability distribution--the more of certain characteristics a given beverage possesses, the more likely it is to be a Weird Soda? We've been giving this a lot of thought at the Lab. At first, one might think that being sweet is an important part of being a Weird Soda. But then you get things like Abali and Arvands, and that goes right out the window (along with your breakfast). 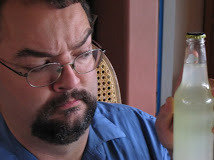 You might think it's carbonation--but some of the things we've reviewed just instinctively fall under the Weird Soda banner, even though they lack carbonation. We thought we had it, though. They must be Weird--and they must be liquid. Surely that is something all Weird Sodas would have in common, right? We're scientists, and it is our job to challenge that kind of assumption. So during the Mitsuwa pilgrimage, I obtained something which is, without a doubt, Weird, and may in fact be a Weird Soda, but which is at least partially nonliquid. Tonight, we shall quaff Tsubutsubu Mikan Jelly. Unshu mandarin orange, mandarin pulp, sugars (fructose, glucose, sugar), acidulant (citric acid), gelling agent (guar gum), flavor (natural and artificial), vitamin C.
It's the "gelling agent" which gets me. I thought the picture of an orange Jell-O mold on the can was some sort of metaphor. Perhaps I was wrong. I am further intrigued by the fact that it provides--apparently--0% of your RDA of Vitamin C. It has mandarin orange pulp and extra vitamin C added. I am at a loss. Also, at the top of the can, without any further explanation, is the phrase "Miss Parlor". It is also the only Weird Soda I have ever quaffed which has a picture on the can which seems to me to be suggesting that it be shaken vigorously prior to opening. I'll just bet that's to loosen the gel. Erk. Color: First, I must upend it five times. At least that's what I think it says. *does so* Sounds ike there's liquid in there. Now, we'll pour it into a cup to see what color it is. Oh my sweet...it's coming out in thick glops. It's half-runny, half-gelatinous. In the cup, it's orange, mostly opaque, with many little leaf-shaped bits of what I hope is fruit pulp. Let me make this clear: I can't pour any more, because the opening of the can has become clogged with gel. When I swirl the cup, it moves, but all together as a unit. K-i-C: "And thus ends your sweet time with non-vomit-inducing sodas." The bits of pulp are suspended in it--they're not falling to the bottom or floating to the top. They're held by the gel, like a nematode is held by a predatory fungus. Scent: Actually, it smells kind of good. Somewhere between Orangina and peach syrup. Taste: as I upend the cup, it slides--slides--toward me. I try to drink it like a soda, but it will have none of it. First, a bit of liquid--then a large chunk of gel insists on all coming in at once, followed by little gobbets. It's a slurry. Oh, the taste? Not bad. Not very strong; a little like a watered-down version of the liquid around canned mandarin oranges. Pleasant, kind of blandly sweet, vaguely orangey. To get the next cupful, I have to shake the can as I pour it. This is the first Weird Soda I've ever had which made me instinctively try to chew it before swallowing. Me: "Want to try it?" K-i-C: "I don't drink lumpy things." It's not bad, just not particularly interesting. The selling point must be the unusual texture. However, I'm guessing that having the texture of Jell-O which one has strained through one's teeth two or three times is only going to appeal to specialists. I believe this definitely qualifies as a Weird Soda, despite its only semi-liquid state. The search for a unified theory of Weird Sodas continues. Quaff rating: 3. The taste is pleasant but uninteresting. Cough rating: 2. Although the gloppiness is not quite as bad as it seemed like it was going to be, it's still darned Weird.